You can limit access to files stored on your site by requiring users to type a password to gain access. This is known as "protecting directories." When users attempt to access a file in a protected directory, the Web server displays a login window. Users with access privileges enter their user names and passwords to access the file. Users without access privileges cannot access the file. 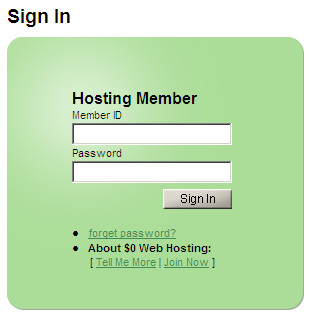 Note: This service is available to Unlimited Hosting users only. 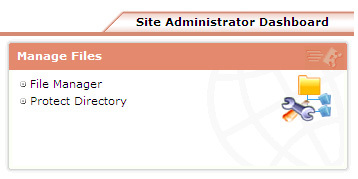 To setup Password Protected Directories, select Site Admin Panel link to access your Site Administration Panel. In the shortcuts area, click Protect Directory (Manage Files section). If you have not done so already, create an HTAccess group and then specify the user or users who belong to the group. You need to create at least one group and add at least one user to that group before you can protect a directory. Click Manage Groups tab. Enter Group name and click Add Group. Enter User Name, Password, select group and click Add User. Select the directory or folder that you would like to protect. For osCommerce users you need to protect /var/www/html/shop/admin/. Click . In the AuthName field, enter a descriptive name for the directory you want to protect. When users attempt to access files, this name is displayed in the login window as the Realm. For example, to protect a directory of employee salary information, you might type Compensation. Click Protect. The lock icon turns 'green' indicating the folder is now protected. In this example when visitors view https://www.doteasyshop.com/shop/admin they will be prompted to enter their userID and password before being allowed to view contents.